Khao'na Kitchen (pronounced KAH-OWN-A), founded by Cole Carothers and Shilpa Nandwani, was built on the footsteps of revolutionaries before us who believed in the power of community and fought for their rights to thrive. Khao na means to "eat now" in Visayan and to "feast now" in Punjabi. A fusion between Filipino and Indian culture, Khao'na Kitchen is a cooperatively owned catering service that also offers coaching around food and wellness practices, in and out of the kitchen. Coaching around food and wellness practices takes shape in engaging, instructor-led workshops as well as curated and practiced one-on-one health coaching programs. I love what you do! Are you a Restaurant? Khao'na Kitchen is housed in Brooklyn, NY where we create delish food magic and send it out to an event near you. At this time, we are not our own brick and mortar establishment...but maybe someday? Why do we think Khao'na Kitchen is important? Cole: "When I moved to NYC as a full-time volunteer, I didn't have a lot of time, money or knowledge about where to shop for groceries. I lived on EBT and found myself eating the cheapest, most filling things that I could find, regardless of how it made me feel afterwards. But thats the thing... food should fuel us, not slow us down. I remember when I ran around the farm where my mother grew okra and corn and how energetic and strong I felt. In the city, there is a huge discrepancy between access to foods that genuinely fuel our bodies and what we have available to consume on a daily basis. With Khao'na Kitchen, there is no compromise between convenience, flavor and giving our bodies the nourishment it deserves. Food should be a celebration, not a chore. With Khao'na Kitchen, participants who order food also have the option to learn about the food and simple wellness techniques to keep them energized. After being recently accepted into Farm School NYC, I am pumped to build out our Food Justice framework in our cooking and teaching." 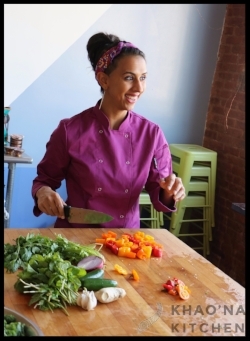 Shilpa: "Food is a universal language, "healthy" is not. Apples, carrots, peaches, celery...just a few of the several fruits and vegetables I am deathly allergic to. Since I was born, allergies to nature and to food has created a deep sense of conflict within, conflicted between being happy, being sick, playing outside, being angry at my body for shutting down. I have finally, as an aspiring health coach, chef, and business owner, learned to love all the things my body does and feels to care for itself and how it experiences the world around me. I know land is life, I know I must fight for food justice, and I know Khao'na Kitchen is proof that dreams built on the needs of the people, love for oneself and others, and passion, do in fact come true. Through Khao'na Kitchen, I hope to help communtiies redefine what healthy is, bring access to knowledge about health, and ignite love for food--all with your help." The reversal of preventable lifestyle diseases and ailments in communities such as diabetes, heart disease, high blood pressure, symptoms of chronic stress and food related adversity. The empowerment of underserved and underresourced youth and communities to love ourselves and our communities through the exposure to hands-on and relevant health and wellness education. The reclaiming of power in communities against toxic food systems that profit off of making cheap and fast food more accessible than nutrient dense and culturally relevant foods. Undoing the generations of war, colonization, displacement, resource exploitation through modern day imperialism, climate change and their damaging effects on our bodies while seeking to end these systems entirely. Through creative and careful construction, Khao’na Kitchen offers the opportunity for folks to invest in their well being through healthy, delicious Filipino + Indian food and practiced wellness workshops & health coaching programs. No other catering service offers these delicious foods remixed in a healthy way while being able to be 100% flexible to dietary needs, restrictions, and preferences. Our approach is unique; combining health and wellness coaching and innovative curriculum with delicious foods inspired by the fusion of the founders’ Filipino and Indian cultures that make healthy living an obtainable goal for anyone. Khao'na Kitchen is a proud graduate of the 2018 Green Worker Cooperatives Coop Academy, a 4.0 Schools Essentials & Tiny Fellow, a member of the NYC Network of Worker Cooperatives and member of the International Coalition for Human Rights in the Philippines.